IWM Duxford is Britain's best-preserved Second World War airfield, with a fascinating history that dates back to the First World War. Its story reflects the landmark achievements made in aviation history. Duxford is Europe's premier aviation museum, where historic buildings intersperse with state-of-the-art exhibition halls, including AirSpace and the American Air Museum. Historic aircraft can regularly be seen taking to the skies from Duxford's wartime airfield. Through the rich displays of aircraft and the powerful stories of the men and women involved, we tell the story of the impact of aviation on the nature of war, on people's lives and on the social and economic history of the region. With one of the finest collections of tanks, military vehicles and artillery in the UK, we also show the impact of technological development on war and conflict. 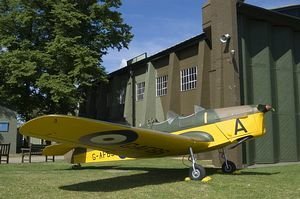 The Museum holds four air shows throughout the year plus other events such as a Military Vehicle Show, American Air Day, family activities, expert lectures and much more. South of Cambridge at Junction 10 of the M11 motorway, approximately 40 minutes from the M25 and 10 minutes from Cambridge city. It is easily accessible from the A1, A10, A14, M1 and the North. Free ample parking is available for cars and coaches.